Hi Ladies! I haven't been on in months and it's been a roller coaster of a year but I am definitely returning to blogging. I've been dealing with family things - my wonderful mom was diagnosed with stage II breast cancer on December 16, 2013 and I was there with her every single step of the way. It was difficult but with the help from our family, friends, amazing doctors and nurses we have persevered. I have GREAT news that after a bilateral mastectomy, several tests, port placement, ct scans, 16 chemo infusions (4 Red Devils and 12 Taxols) my mom is now done with her chemo treatments and her scans are clean. I am elated and overjoyed and know it's still a long road ahead. Life is so precious and I know how short our time is on earth so I have been off from work since February and actually formally left my job in June. I ended leaving my job so I could fully dedicate my time to being with my mom and caring for my son. It's been great but I'm definitely ready to return to work and have started looking for work. Thanks to my husband for being there so I could take this time off. It's been so weird because I've worked straight for the past 18 years but it was so nice to take this time off. I learned to start taking of myself after my mom's diagnosis because after seeing what she had to go through, I never want to go through it myself. Cancer is such an terrifying disease and I would never wish it upon anyone. I've learned to try and eat organic/clean as much as possible and to cook my own meals so I have more control over what my family and I eat. I try to urge everyone I care about to start watching what they put in their bodies because it can affect us in so many ways. I do try and indulge once in a while but start right back to eating clean the following day. As for my little boy, well he's been great! 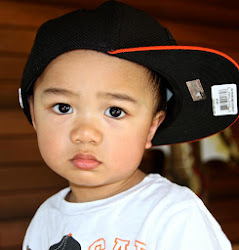 He's 3 years old now but still challenged in his communication skills. He starts speech therapy in late August for four days a week and I can't wait for him to start speaking in sentences. Anyway, how are you all doing? Hi All! How was your Halloween? We had a great time here in San Francisco! My family and I trick or treated in the Noe Valley area and had an amazing time. The stores started giving out candy around 2 pm which was awesome and good to know because next year we are definitely starting our trick or treating early. Mason was so tired when we started because he just woke up from a 3 hour nap so he wanted to stay in his little stroller at first. We walked around 24th street in Noe Valley and then trekked over to Fair Oaks. Fair Oaks was amazing! They blocked off the streets and there were tons of amazing costumes and kids running around. One house also had dj and an MC which was so fun. We danced around in the street with the other trick or treaters and Mason just had a ball. We stayed out for some time and didn't get home until around 11:30 pm and the little one was still all smiles. He just had the best time. I can't wait until next year. Here are some pics from our Halloween party. Hi All! 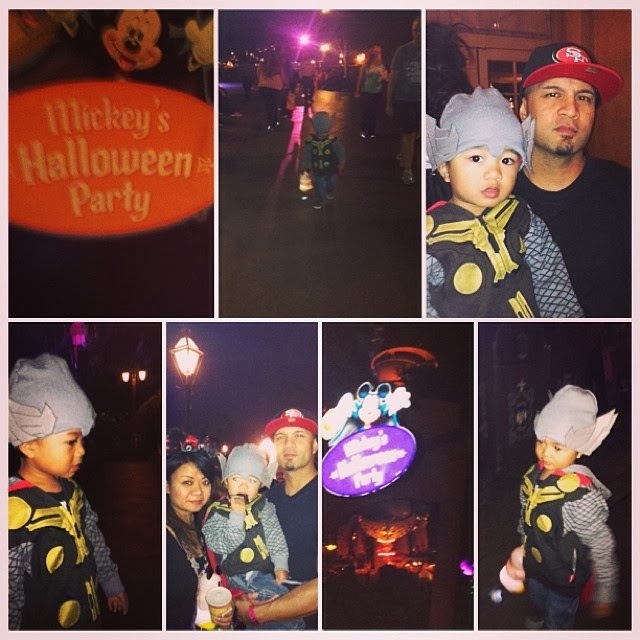 I love Halloween and this year my family and I got to participate in the Disneyland Halloween party. It was amazing and Mason had the best time of his life. Disney did a great job with hosting the party. The party is open to all guests who purchase tickets for the event. The Halloween party is usually from 7 to midnight or 6 to 11 pm and your ticket allows you to enter the park 3 hours before the party. Your ticket also allows you free parking at the Disneyland parking structure which is awesome! We didn't bring a car because we were staying at the Disneyland hotel and didn't need a car. 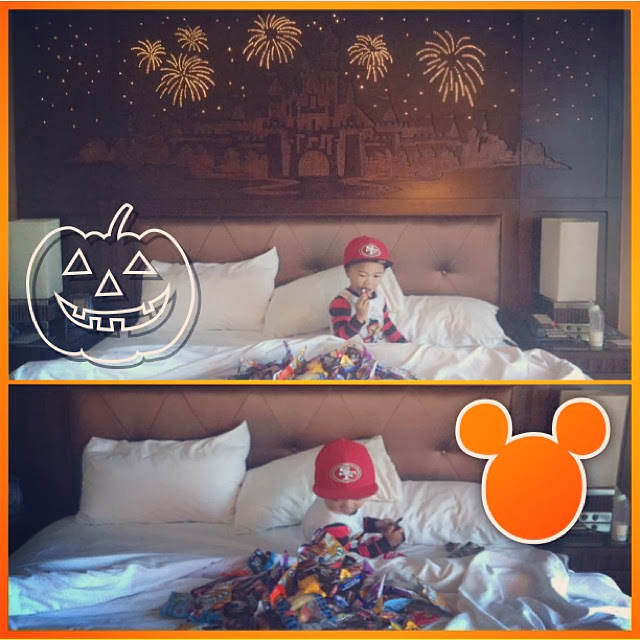 If you can swing staying at the Disneyland hotel or the Grand CA hotel I would say do it! It's so convenient to walk back and forth to the hotel and park. We went to the park early in the morning on Friday and then played in the hotel pool. I made sure that Mason took a nap later in the afternoon so he would be refreshed for the event. The little guy had so much fun that he stayed up for the entire event and didn't go to bed until 1 am! Such a party animal. We had an amazing time. If you go, they give you a wrist band for the the event as well as some treat bags. The treat bags are teeny tiny so make sure you bring one large bag to stash all of your goodies in. We probably hit up around 5 treat trails and came home with TONS of candy. We loved it. Definitely stay for the parade and enjoy the fireworks. I think we're going to make this a yearly event from now on. Highly recommend! It's awesome for the kids and such fun for the adults. Hi All! I'm a first time mom to Mason and wife to Shane. My life has completely changed since I've had my baby boy and I wouldn't have it any other way. Join us as we share with you our daily adventures.